BroadLink® IR-RF Automation Hub: Need an easy phone app system? Take a look at our affordable blind and shade hub, operated by Android and IOS apps. This hub can "learn" RF radio signals for our blind motors and skylight/window openers! It is also has IFTTT event triggering (if-this-then-that) and the e-Air module can sense light levels to control motors. In part 1 we discussed how the MCS-1-RF wireless window mounted light sensor can be used to activate our radio equipped blind and shade motors using RF (Radio Frequency). In part 2, we will become familiar with the layout of the controls and features of the unit. At this point the light sensor cover should be removed, the battery inserted into the battery compartment, and the light sensor unit powered up, as shown in the picture on the right. Also, please note that the 'confirm' switch behaves the same way as the switch of the same name on our regular remote controls (re channel assignment). You will, however, need a regular remote control to set travel limits on the blind motor. An important point that makes this system unique: the motor operation can be reversed. This means that if you are attempting to block bright sunlight, you can close the blinds when the light gets bright, and open them if it becomes cloudy. If you are using it to close the blinds at dusk and open them at dawn, just reverse the motor operation. You can also use this sensor with a timer to facilitate light sensitive operation for blind & shade control AND timed operation. This red/green LED is used to indicate various states during the setup phase, and motor activity during normal operation. 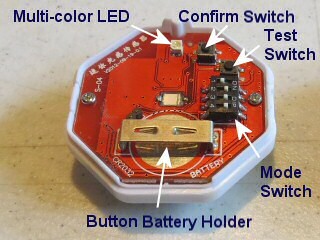 The confirm switch is used to pair the motor with the sensor unit. When pressed, it causes the unit to issue a 'handshake' signal while the motor is put into a special 'listening' mode (see part 3). The motor decodes the handshake signal and stores it in its onboard memory system. Once the code is stored, the motor will recognize any subsequent commands coming from the sensor unit when the daylight thresholds are reached. This switch is used to configure and test various settings during the setup phase. During normal operation it can be toggled to issue up, down and stop commands. The sequence is Roller UP (red LED), Roller STOP (red + green LED), Roller DOWN (green LED), Roller STOP (red + green LED). Weak Light Level Operation: The blind is activated only when it gets dark. This is useful if you want to manually open the blinds with a hand held remote in the morning (or open the blind with a timer). Strong Light Level Operation: The blind is activated only when it gets bright. This is useful if you want to manually close the blinds with a hand held remote in the evening (or close the blind with a timer). Cracked Glass Operation: This light sensor has the ability to detect sudden rapid changes in light level, such as when forced entry is attempted by smashing a window. This can be useful in storefront situations where metal roller security blinds are used in display windows; it is not normally used in domestic applications. Multi-mode: You can also use any combination of the above 3 modes, including weak and strong light level operation, so that the blinds will close at night and open in the morning as soon as daylight appears.